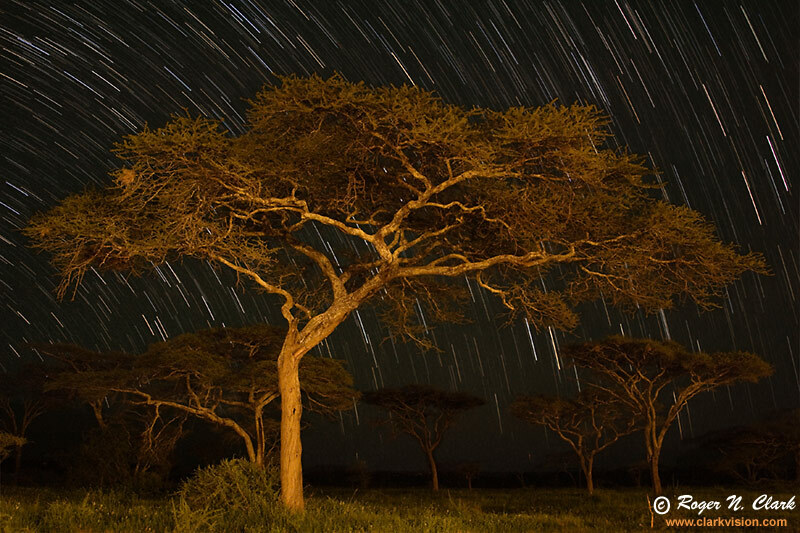 Star trails and beautiful acacia trees, Tanzania, Africa, on the edge of the Serengeti. The trees were illuminated by incandescent lights from nearby cabins. The north celestial pole is off the left frame edge, in this view looking northeast. Technical: Canon 1D Mark II 8-megapixel camera, Canon 28-135 mm IS lens at 28 mm, f/3.5, ISO 800. Exposure: 14 one-minute exposures were combined. Full frame image; no crop. The images were combined using two methods: 1) max value , and 2) average. Small gaps between exposures caused gaps in the star trails. The gaps were filled in by duplicating the max value image, then rotating the image slightly and combining the result using max value. Next the max value result was overlaid on the averaged frames and the foreground was masked and deleted resulting in a high signal-to-noise ratio foreground with stars in the background.